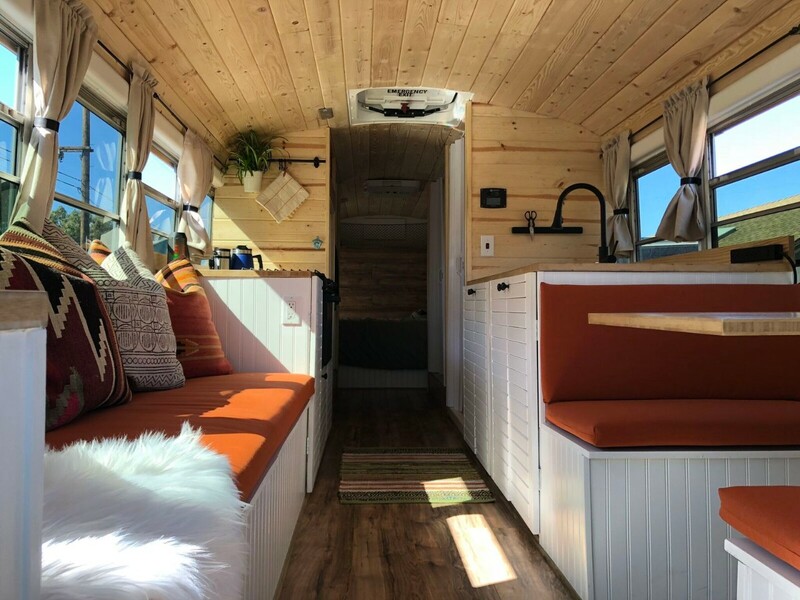 Converting an old school bus into a tiny home on wheels was something that we never thought we would do, or could do for that matter. I had a small amount of knowledge in things like heating and air conditioning as my father owned and operated in that field for many years. I dabbled around in tile for a summer with a family friend right after high school as well as some construction here and there. None of that however prepared us for Skoolie Conversion from the inside out. One thing we did know was that there is an abundance of information a click away. The internet is filled with Skoolie forums, YouTube tutorials and limitless blogs answering any question we could have had. Having good friends that do this kind of thing for a living is also a huge plus. Now that it is all said and done, our home is built and we have been on the road full-time for just over five months, I want to share with you the steps we took to make our dream a reality. The first piece of advice I will give you is to pick a bus that will fit your needs. There is actually way more to it than just finding a bus on Craigslist that looks cool and figuring out how you are going to make it work after you buy it. Take into account how many people are traveling with you. Start with sleeping arrangements and then move your way forward. You might find that you can’t fit a king sized bed for you and your wife, bunks for the kids and still have room for a seven foot couch. Now you are forced to downsize because your bus is too short. Design first, buy your bus second. Next step is planning where you want your new home on wheels to go. Something we never considered was that buying your bus somewhere else can completely change what transmission you get and how the bus is geared. We have been forced to stay away from places that we wanted to experience because our bus simply won’t make it up the hills required to get there. 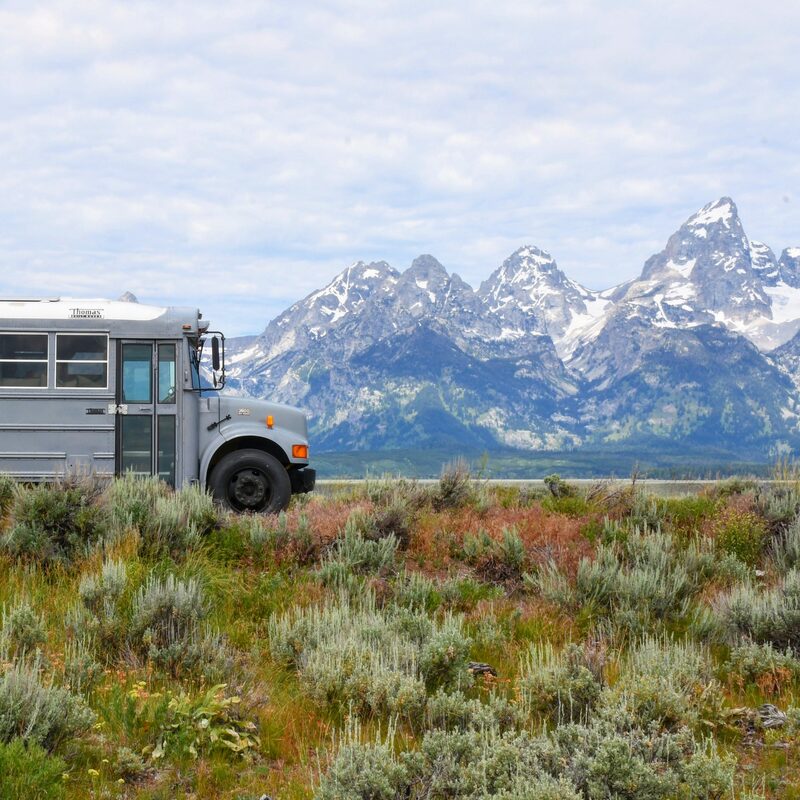 If however, you purchased a bus from somewhere like Colorado or Utah you would be confident in knowing that it was designed with a transmission and gearing that will get you up and down the mountains with zero problems. The bus we purchased is a 2001 International with a DT466e engine and an Allison 2000 automatic transmission. It had a little over 128k miles on it, was already painted grey and had the rear side handicap door we were looking for. 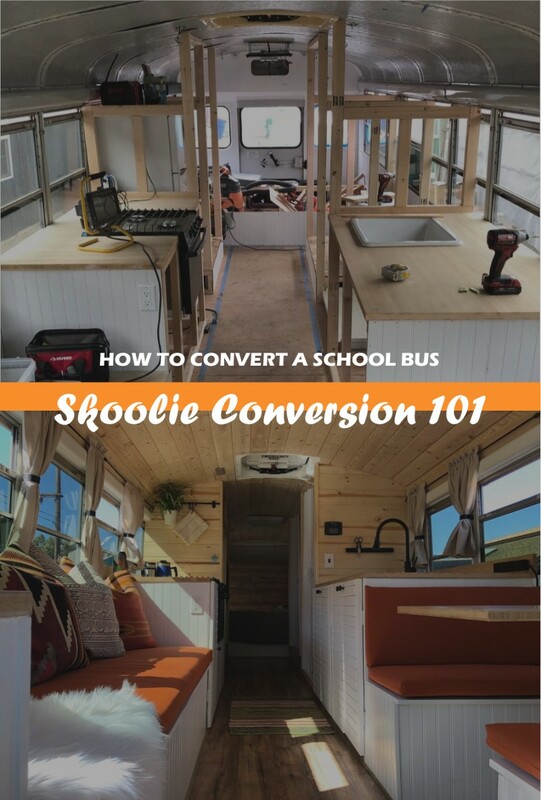 We started our skoolie conversion where most people do, taking out the seats. This process is different for everybody. Our seats were placed in a track that allows you to move seats forward and back. To unbolt them from the tracks I had to go underneath and use a deep socket to hold the nut while my girlfriend Lexi loosened the bolts from the top. Some were easily accessible and some were not. This step took a lot of patience and teamwork. We cut and peeled back the old rubber and used pry bars to pull up the existing wood flooring by popping it off of the nails and then grinding the heads of the nails off later. Once the floor was up we had to remove the rear bus heater. This was something that YouTube certainly helped with. The way it works is by having hot coolant from the engine run in a line all the way to the back of the bus into the heater and then back through another line into the engine. In order to take this out, we had to loop the lines back to the motor. This process is a bit of a mess but if you need to do it, make sure to check under your hood to see if there is a coolant valve that you can turn off so the only liquid you are dealing with is the coolant that is already in the line running to the heater. 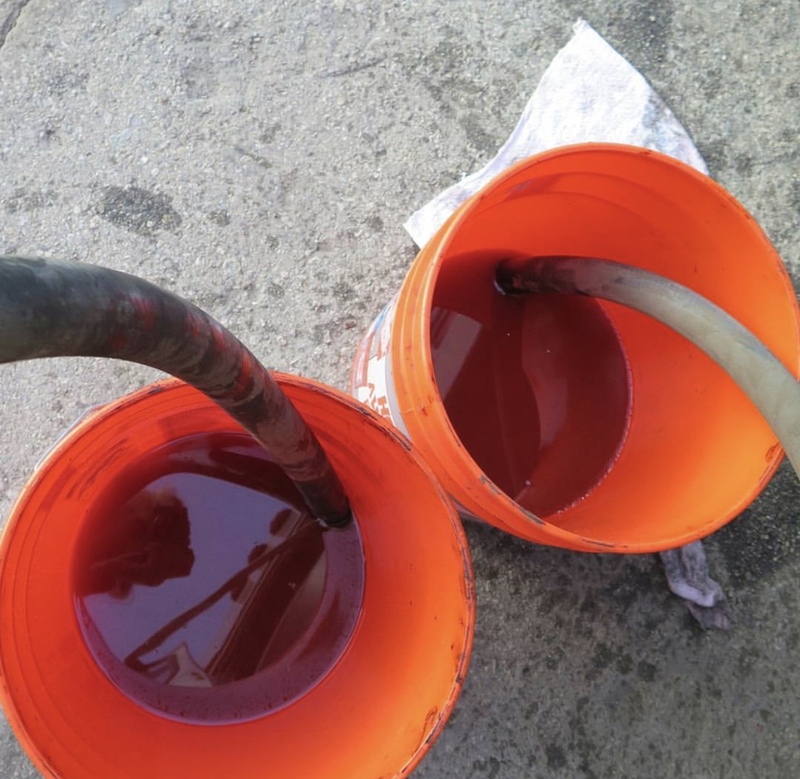 Cut the lines as far up to the driver seat as you can, empty the coolant into a bucket and using the right fittings capable of dealing with hot pressurized liquid, connect the two together. Then unbolt the rear heater and drain what is in the remaining lines into the bucket as well. We were then clear to start the subfloor. After cleaning it as best as we could, we painted on a layer or two of Rust-oleum. We used two-by-fours to frame the floor and Lowe’s 2 inch insulation board cut and wedged in-between. Then we placed and screwed 3/4 inch plywood down from front to back. 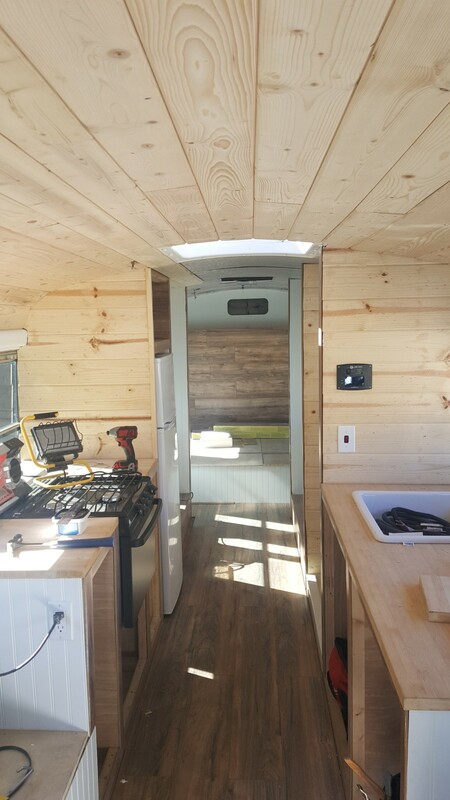 Something that we did differently that is entirely based on personal preference was not insulating the walls and changing the original bus windows. We planned to travel with the weather and never be in a place that is too hot or too cold. We painted the side walls white and figured aesthetically you would not see them after we framed everything out. It looks nice but staying within perfect weather all the time is nearly impossible. Unless you completely take out the windows and insulate everything you are going to be hot or cold at some point. 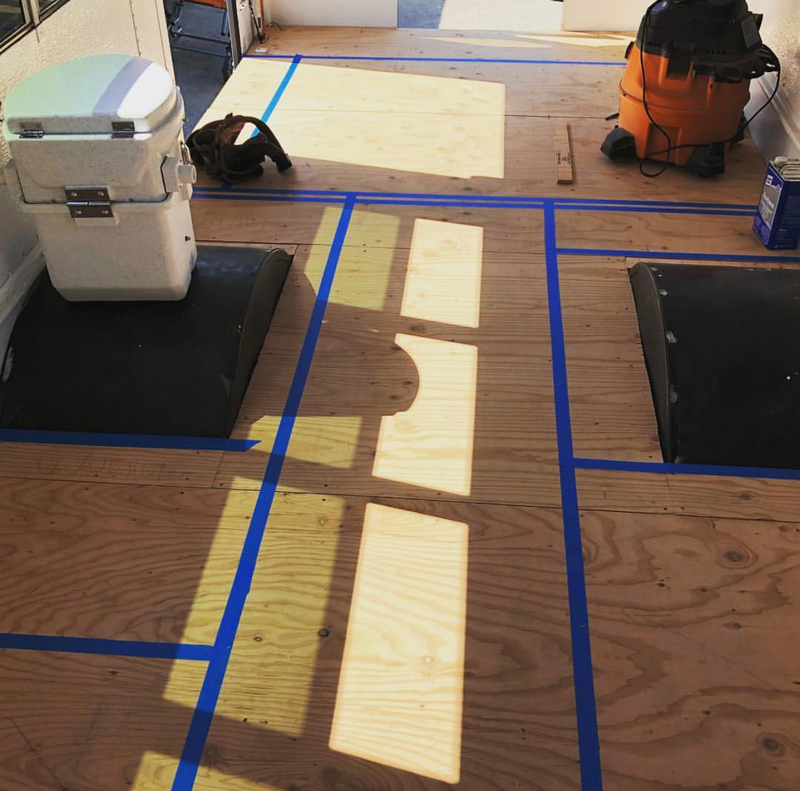 After the subfloor was done we began taping our layout. Then redesigning and taping again and again until we got it right. We must have drawn out twenty different layouts before we decided on one that would actually work. This goes back to what I previously said about knowing your design before you buy your bus. The whole purpose of finding a rear side handicap door was to build a garage wall and transport a motorcycle inside. That plan quickly took a turn when we pushed everything up five feet to incorporate the garage and nothing fit right anymore. Not to mention we forgot about the wheel wells! Which are a huge obstacle to overcome when attempting to figure out where to put your bed, a shower or a toilet. We decided to scrap the whole “motorcycle in the bus” idea and figure out a way to put it on the back at a later time. Instead, we built a garage space roughly a foot and a half deep only accessible from the back door to store things like tools, motorcycle and backpacking gear, extra cords and our peat moss for the compost toilet. The framing started with the bedroom and worked it’s way forward. 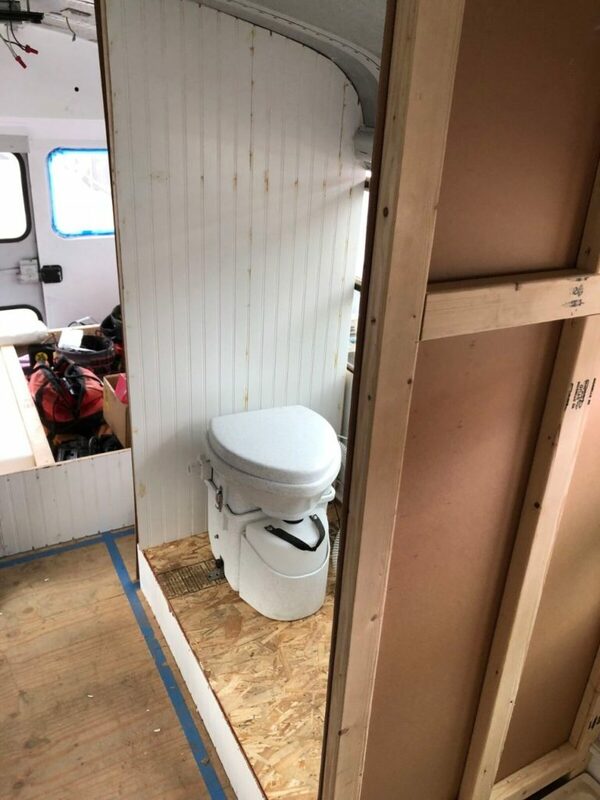 We skipped over the wheel wells for the time being, knowing that we were putting our toilet on one side and the closet on the other. Moving passed that we placed a three-by-two foot shower pan in front of the wheel well, framed around it and up to the ceiling. In front of the opposite wheel well we framed a spot for our apartment sized refrigerator from floor to ceiling that is just over two feet wide. We love to cook so a lot of counter space was a necessity. We decided to do a counter of just over four and a half feet on both sides of the bus. The shower and toilet side incorporates our kitchen sink and the refrigerator side is home to our oven. Rather than building drawers underneath both sides we simply repurposed some free cabinet doors we found outside of a job site that were being thrown away. Underneath our sink is a set of double doors, one of which opens to reveal our trash can, cleaning supplies and extra water. The other is a basic plastic four drawer cabinet that holds our silverware, tupperware and various kitchen items like trash bags, oven mitts and towels. There are three cabinet doors on the stove side. The door underneath the oven holds our pots and pans, one side holds dry food storage and dish ware and the other side is used to store propane. Our counter tops are made from bamboo which we got for next to nothing from a friend of ours. Finally, beyond that is our two-person dinette on the driver side and our seven-foot couch on the other. Beneath each of our two and a half by one and a half foot dinette seats is storage where we house a 3000 watt AIMS power inverter, shore power cords and leveling blocks. The couch serves as storage as well, containing off season clothes, camera equipment, medicine and toiletries. The cushions for the couch and dinette were made to scale from a website called customcushions.com. 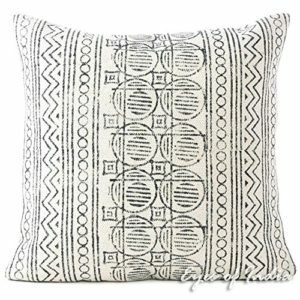 We decided not to spend the money on a back cushion for our couch and instead used old 24”x 24” pillows and bought new pillow cases from Amazon. Once the initial framework was done and electrical ran, we began putting up a total of seven dividing walls. Two on each side of the wheel wells to close off the closet and two on the opposite side, surrounding our Nature’s Head compost toilet. We then added another wall to close off the shower and another on the adjacent side of the refrigerator. The last remaining wall built was behind the bed frame to close off our garage space. To keep things light, simple and most importantly cheap, we faced most of the walls with white beadboard. 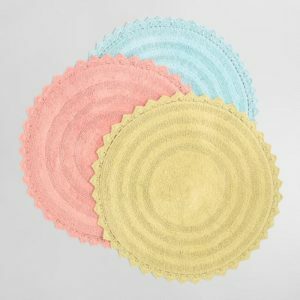 It looks great and is very easy to keep clean. Another thing that we have seen people do differently is to put down their flooring before they start framing. For us, buying extra flooring to then build on top of it and cover it up seemed like a waste of time and money. Plus, it opens up the possibility of damaging your floor during the build process. 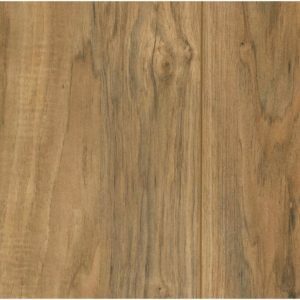 We purchased laminate flooring from The Home Depot in the Lakeshore Pecan finish and started with the small walkway of floor space we had. After realizing we had extra we used the remaining pieces to cover the back bedroom wall separating the garage as well as small pieces used as trim to add to the unfinished areas like in-between cabinet doors. Our bus is equipped with two fifty-five gallon tanks. One for fresh water and the other for grey water. The fresh water tank is located inside the bus underneath our bed to protect the tank from the elements. 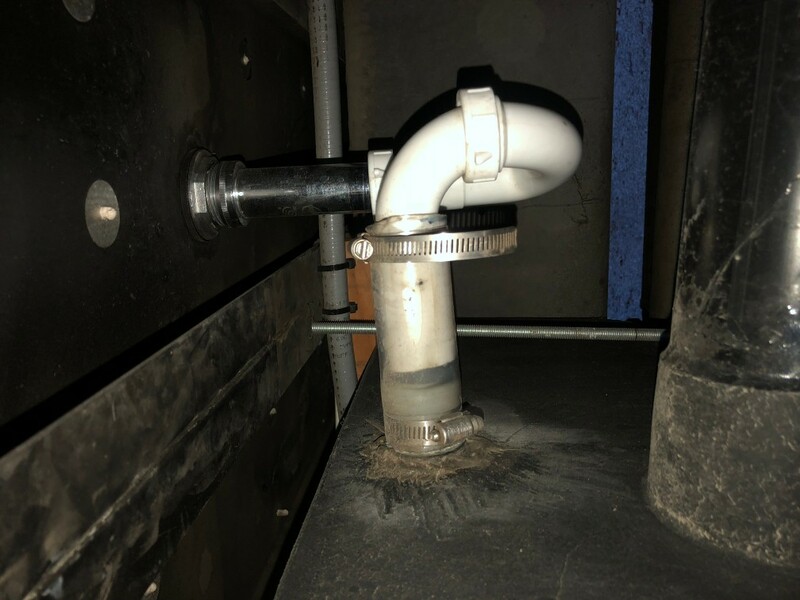 We cut a hole in the top corner of the tank and ran vinyl tubing to and from a hole cut outside of the bus and attached an RV gravity feed inlet. We then ran the same tubing from the bottom corner of the tank along the floor and through the walls to a 20PSI Jabsco water pump kept under our sink. 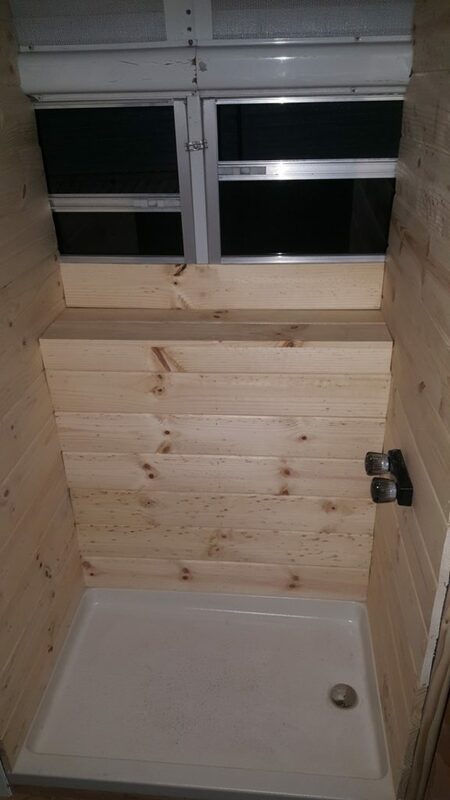 We have yet to install a water heater being that we typically try to use our shower as little as possible. 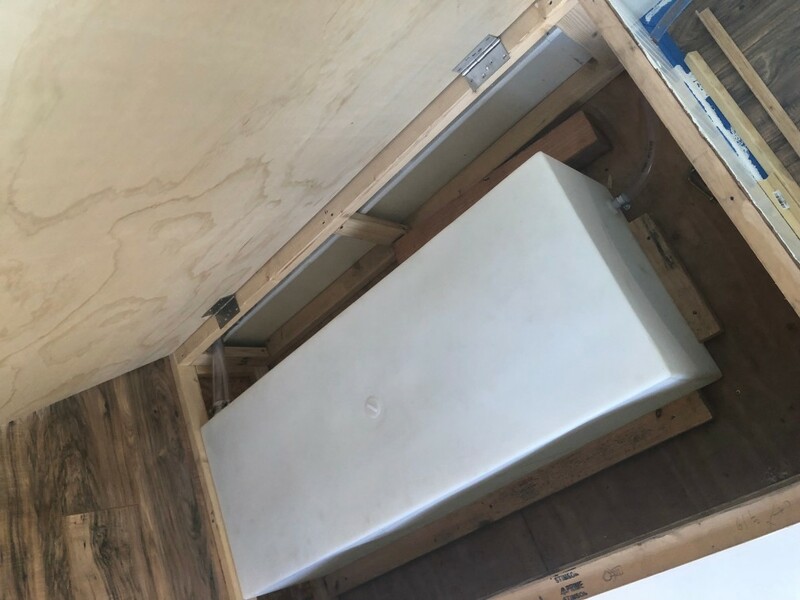 The grey water tank is mounted underneath the bus and has a standard P-trap under the sink that then runs through the floor and straight into the top of the tank. The shower drain runs through the floor and into a P-trap under the bus that then enters the tank on it’s side. 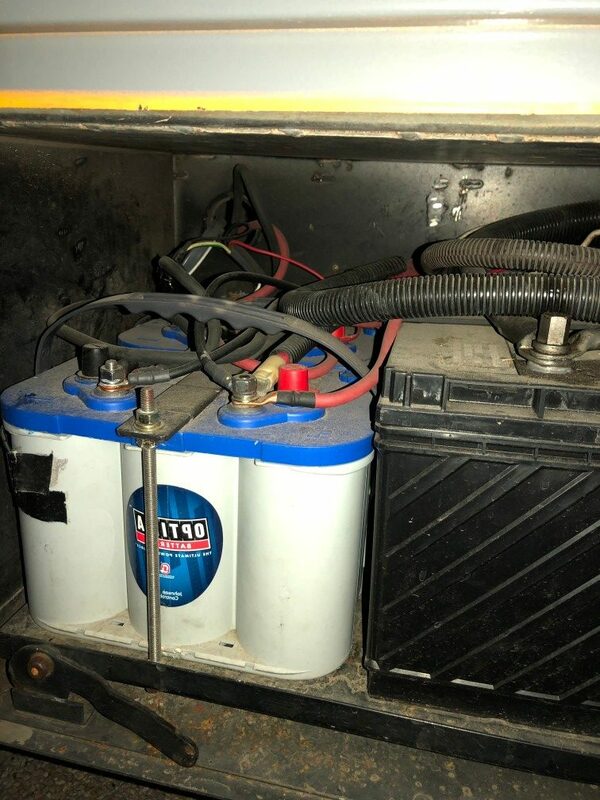 The power for our bus is provided by two Optima BlueTop Deep Cycle Marine 12-Volt batteries as well as a 400 watt solar system from Renogy. Both of which are ran through a 3000 watt AIMS Power Inverter. If you are like us and know nothing about electrical, then this step might be tough. We had a ton of help and even hired a friend of a friend to come out and run everything properly and install the right safety precautions. I would definitely recommend at least 600 watts of solar. Even our 400 watt system has been a lifesaver and adding a couple more panels is something we are doing in the near future. 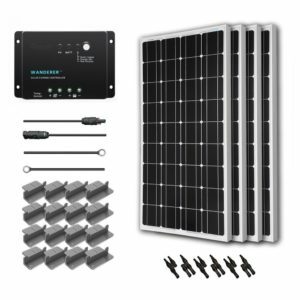 To learn more, here is a helpful step by step guide to solar panels and off grid electrical systems. Last but not least, the ceiling. That was something done at nearly the very end. The original plan was to use the same white beadboard on the ceiling but the bend in the roof was too great and the board kept breaking. 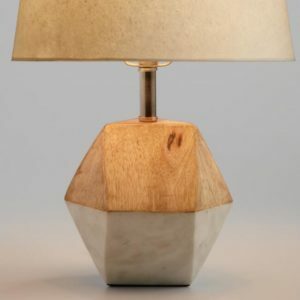 Eventually, we decided to go with Tongue and Groove pine and could not be happier with the outcome. 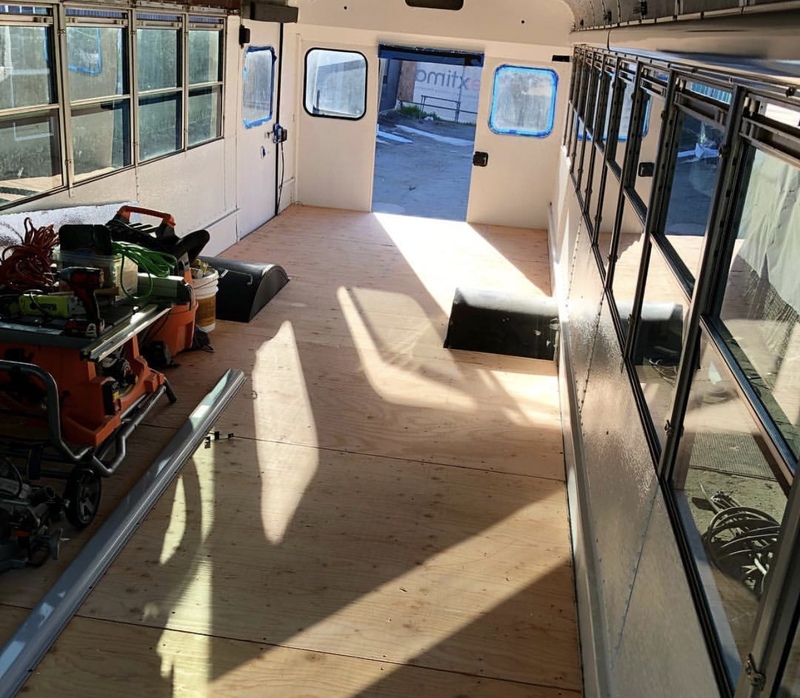 Our bus came from Arizona and already had a few inches of insulation between the roof and the typical metal grate ceiling so we decided, if we can fasten the wood through to the ribs in the frame and still have head room, there is no need to rip it all out and start from scratch. Happy to report that after five months on the road through some terribly bumpy terrain, the ceiling is still holding strong. 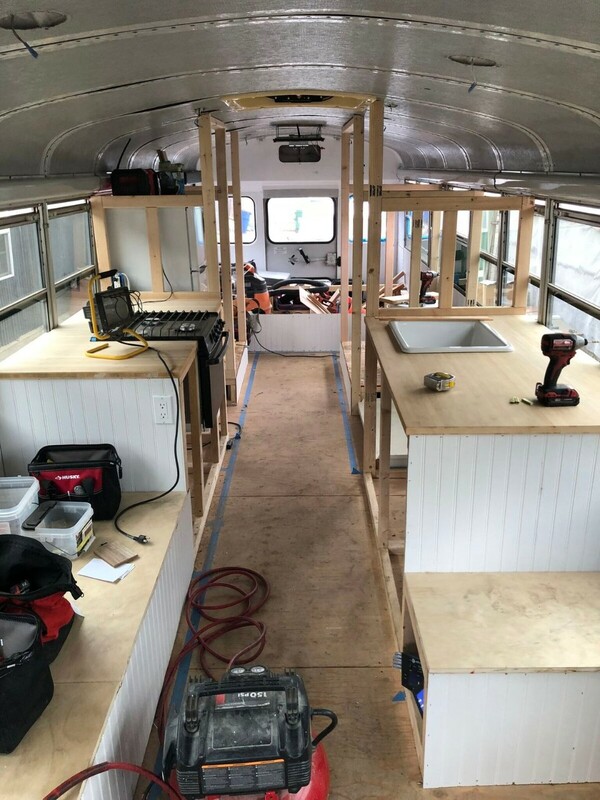 The duration of our build took close to eight months from start to departure and after buying the bus for ten thousand, purchasing all the materials and equipping the bus with all of the necessary appliances and decor, the total cost was around $25,000. 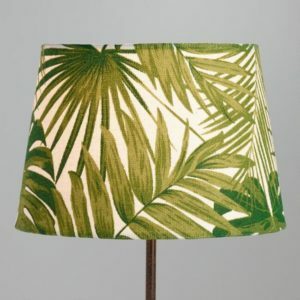 Some of the biggest purchases we made were things like our Nature’s Head compost toilet, our Avanti energy star refrigerator and our custom cushions. The original AC did not work so we ripped it out and installed a Dometic RV unit on the roof. If we had to go another route we would have instead gone with a Mini-Split unit AC. Even with our 3100 watt Champion generator, our current AC only works when we are plugged into shore power. Not to mention only cools down the bedroom. We also downsized from a king size mattress in our apartment to a new queen size from Zotto. We added a 32” Samsung smart T.V. on a swivel mount to the bedroom and brought along our PS4 and Blu-ray collection. 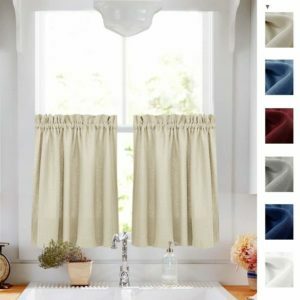 The smaller purchases were things like our bathroom and shower doors, which are white accordion style from Lowe’s, knife racks, curtain rods and storage bins. 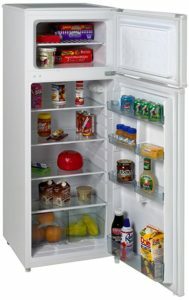 This Avanti Fridge is the perfect size for us. 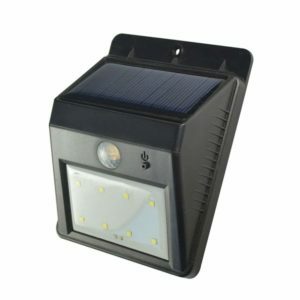 120V, energy star rated, and works great with our 400 watt solar panel setup. 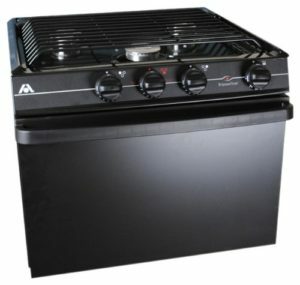 Very basic RV camper propane oven. No complaints! 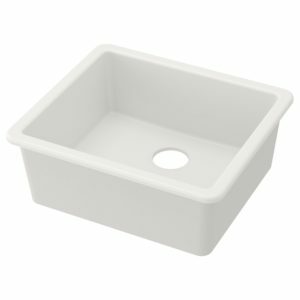 Perfect size sink from Ikea. We don’t recommend going any smaller. 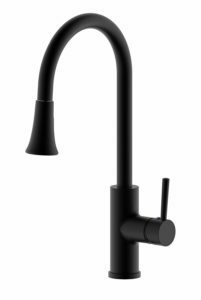 We wanted a matte black faucet to go with our other black accents in the bus. 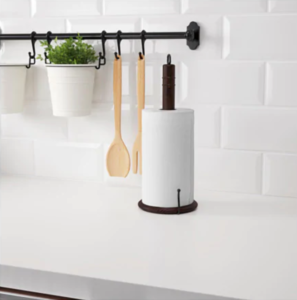 It is a pull down as well, so it makes washing dishes easier. These rails are a game changer! They hang all of our cooking utensils and even a plant! They are the perfect alternative to cabinets or shelves. Especially in a moving bus, everything stays put on these rails. 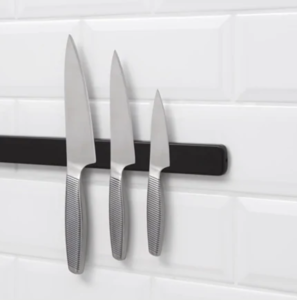 We were a bit skeptical about getting a magnet strip from Ikea, but it has yet to let us down and it was only $12.00. A lot of other bus conversions have these in their kitchens! We ordered our cushions from customcushions.com. The fabric is Sunbrella and the color is Rust. 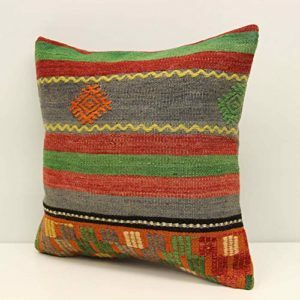 These pillows are all handmade with a unique pattern and color. 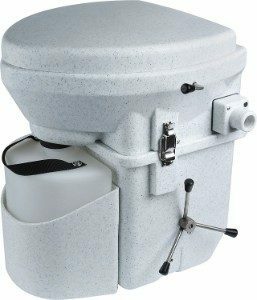 This toilet is expensive but it’s easy to clean and simple to use. Not dealing with a black water tank is a major plus. The perfect size rug for a Skoolie toilet. Renogy 400 watt Wanderer Kit. 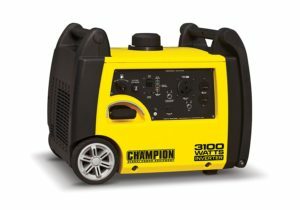 Awesome generator that is relatively quiet and has a remote start option. 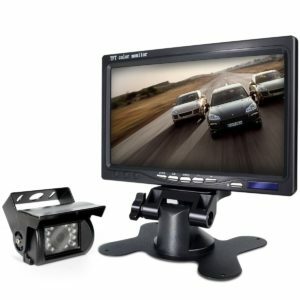 Backup Camera and 7 Inch Monitor Screen. It’s cheap and not the clearest but DEFINITELY a must have in a school bus. These have been extremely helpful when we are parked places where there isn’t much light at night. We glued magnets to the back so we can stick them anywhere on the outside of the bus when needed. They are motion sensor as well and can act as security. 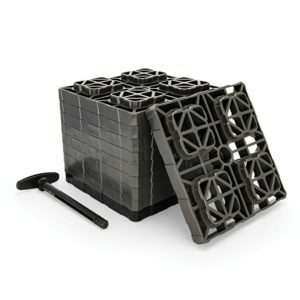 Camco XL Heavy Duty Leveling Blocks. We have been using these a lot and they are extremely durable and compact when not in use. 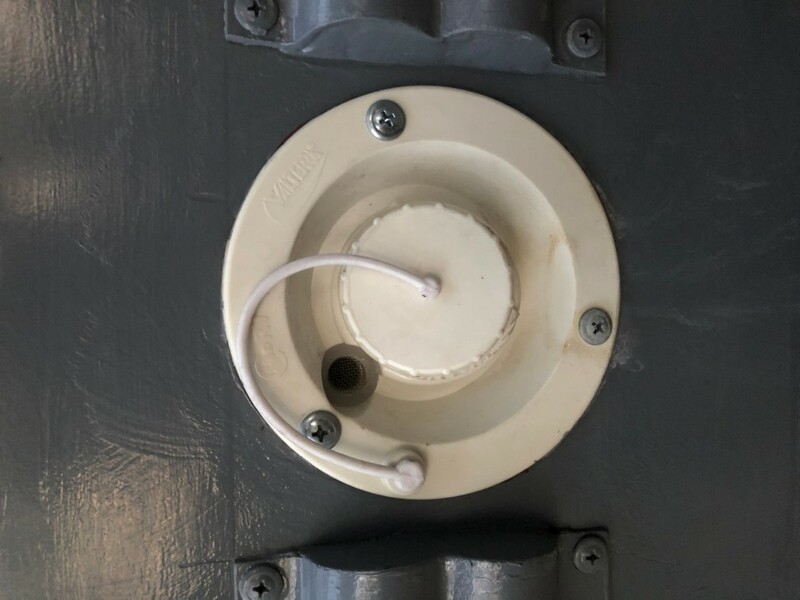 We installed a switch panel in the front of the bus which has a USB and 12volt charge connector. 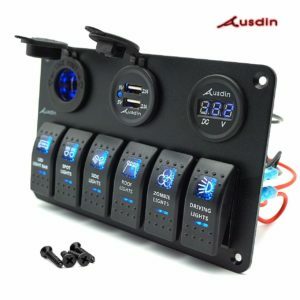 It controls exterior and interior lights and allows us to see how many volts we are at. 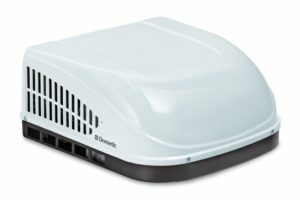 Dometic Brisk II Polar White Air Conditioner. This unit works great in small areas, but if you have a big bus we recommend getting two. 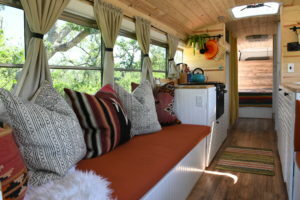 One of the greatest aspects of building a tiny home on wheels is having the freedom to do exactly what you want. You can put as much work into your new home as you find necessary and the possibilities are endless. Whether it is an extravagant build that takes years allowing you to go off grid for months at a time or you just throw a mattress in the back, pack some clothes and take off for a few days. At the end of the day, you are still building a home. Only there are no permits needed or inspections required and you will never second guess moving to the wrong neighborhood because you can always just start the engine and hit the road. This Article was written by our friends, One Wild Ride. 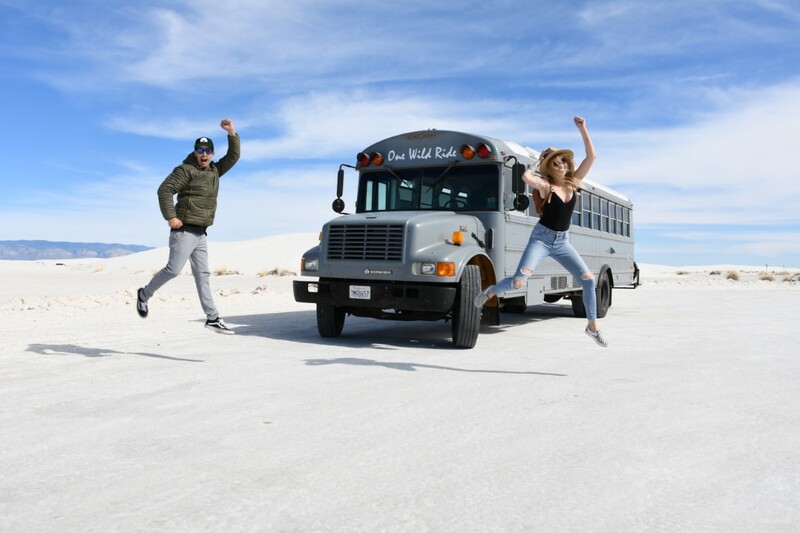 You can check out their awesome skoolie adventures on Instagram @onewildridebus.